No big deal, folks. 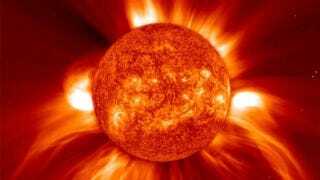 The sun keeps exploding, but everything's probably fine. "Three large explosions from the Sun over the past few days have prompted U.S. government scientists to caution users of satellite, telecommunications and electric equipment to prepare for possible disruptions over the next few days...Solar storms this week could affect communications and global positioning system (GPS) satellites and might even produce an aurora visible as far south as Minnesota and Wisconsin."